I teach guitar and ukulele part time in a local primary school with students ranging from 6 to 11. I offer tuition in all styles with the emphasis on technique and an understanding of the fundamentals of understanding music. I also offer tuition in music theory, exam preparation and any other area that is of interest to the student. I have been teaching part time for the past 30 years and offer a completely bespoke style of tuition dependent upon the individual needs of the student. Students of all ages and abilities are welcomed. 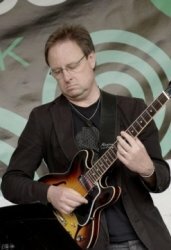 My emphasis is on technique and understanding of music, allied to your choice of music and the sort of progress you want to make.All lessons are on a one-to-one basis at a time of day that is mutually convenient. I currently have very few vacancies and am looking at this point to only take on intermediate or advanced players.